It will be all systems go tomorrow morning as fans of Drake will sit at their computer screens to be the first to get their hands on tickets for his UK tour scheduled for March 2014. 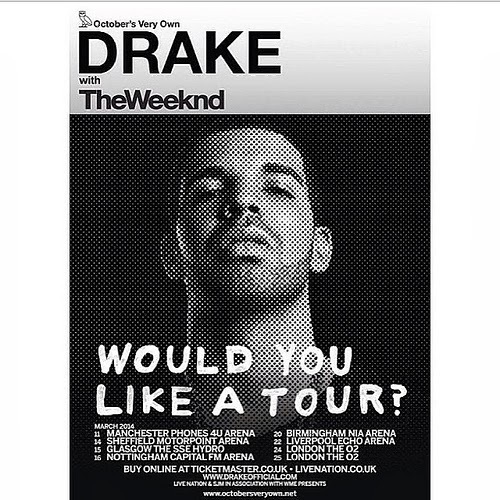 The Grammy Award-winning, multi-platinum selling, recording artist announced earlier this week that he will be returning to the UK in March 2014 for arena shows in seven cities. The tour will start in Manchester on March 11, and visits Sheffield, Glasgow, Nottingham, Birmingham, Liverpool and London with support on all dates from special The Weeknd. The tour is in support of Drake's new album ‘Nothing Was The Same’, which is currently underway in the States with special guests Future, Miguel and PartyNextDoor.